Papua New Guinea Deputy Prime Minister and Treasury Minister Charles Abel, has launched the government's 100 Day Plan to kick start the implementation of the Alotau Accord 2. 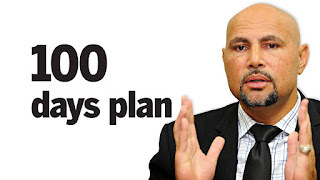 Mr Abel launched the plan on Friday, saying the 25-Point 100-Days Economic Stimulus Plan is expected to resurrect and turn the economy from its downward plan and put it back on the path to recovery and growth. He said, whilst the medium term outlook is positive, the government is determined to undertake some immediate interventions after consultation with government agencies, development partners and the business community to take these steps. Mr Abel says the government has placed the plan into five categories which will see them maintaining fiscal discipline and boost foreign exchange, grow the country's revenue, strengthen the economic base, improve it's governance record and acting strategically to turn back the economy. The country's Treasurer also says under this plan, the government will not be imposing any more taxes on anyone but overhaul and simplify it, to make it fairer and easier to collect what is due, move to self reliance by generating energy from the oil, gas and hydro, grow our own rice or find a locally sourced alternative, because these are some of the highest government's expenditures.